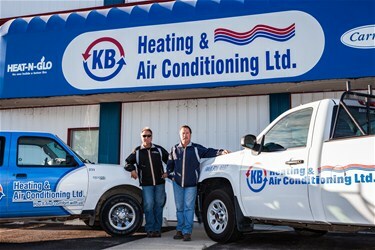 Founded in 1983, KB Heating and Air Conditioning Ltd. has grown from a one-man operation to an industry leader. Built on a foundation of residential heating and air conditioning, founder Keith Broadbent, together with his partner and brother, Greg Broadbent, had the foresight to ensure their company could expand to service commercial and industrial customers with the same care and expertise they applied to their residential customers. We have been involved with Residential construction since 1983 and have established strong relationships with some of the largest homebuilders in the area. We also specialize in custom homes and can provide you with suggestions and solutions to meet your needs. Give us a call – we can put our vast experience to work for you. KB has also been involved with Commercial and Industrial projects since 1988. Because of our long history of successful project completion, we have the established company foundation and experience to complete all sizes of projects in a successful and timely manner. Should your project require bonding, it is readily available. KB Heating and Air Conditioning Ltd. is a proud community supporter. We are a regular contributor to the Stars Lottery Home, the Lethbridge Hurricanes Hockey Club, Lethbridge Athletic Association, Lethbridge Minor Hockey, Lethbridge Baseball and many other organizations..